Society Hill is a historic neighborhood in Center City Philadelphia that boasts the distinction of being one of Philadelphia’s oldest neighborhoods. The neighborhood is bordered by the Delaware River to the East, Walnut Street to the North, Lombard Street to the South, and 8th Street to the West. 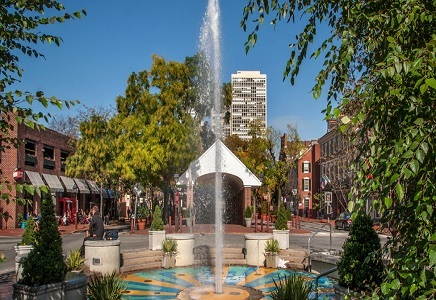 Society Hill boasts homes with a price range of $71 to $3,100 per square foot. The distinction of being the most expensive home in the neighborhood belongs to the Society Hill Mansion, listed at $16,795,000. The neighborhood boasts many historic churches, rowhomes, and museums. Well-known historic attractions such as Independence Hall and the Liberty Bell are located within walking distance. Residents are also placed in close proximity to outdoor activities such as Penn’s Landing along the Schuylkill River and Washington Square Park. Many fine dining restaurants such as the highly-acclaimed Morimoto and Michael Solomonov’s Zahav are also nearby. The neighborhood boasts all of the amenities that families and urban professionals may come to desire.